EXTRA! EXTRA! READ ALL ABOUT THEM! These are just a few of the many articles about Andrew and Eli. To read one simply click on the title of the article and you will download a PDF of the complete article. Acrobat viewer is required and if you do not have it is available as a free download here. Just a note most machines do have this program installed on it and it will automatically open once you have downloaded it. 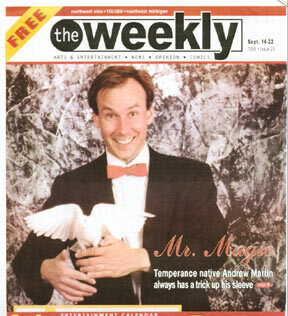  January 2003 The Toledo Blade - On the job: With Andrew Martin Professional Magician. 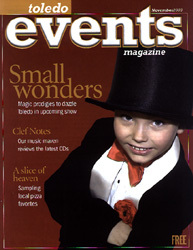  August 2001 Mackinac Island Town Crier - Magician Martin bringing act back to island.  July 2000 The Toledo Blade - The magic of science is coming to COSI.  October 1998 The Toledo Blade - TSO Conductor head over heels for Halloween.  November 1999 The Gaurdian - Magic Man: Bedford native deals in slight of hand.  September 1999 The Weekly - Martin masters the tricks of his trade.  August 2002 The Toledo Blade - 6-year-old magician becomes youngest winner of tourney.  July 2002 The Toledo Blade - There's magic in the air when 6-year-old takes stage. ©2007 Andrew Martin Magical Productions, LTD. All Rights Reserved.